There are ten days remaining in 2011 so we thought we would countdown and share with you some of the items and ideas we would put in our time capsule. For us they straddle the very specific space of the timely with the timeless. Sometimes sublimely anachronistic but always fundamentally classic. La grande allée du château de Oiron is firstly a permanent installation by Cyprien Gaillard (born in 1980 in Paris, lives and works in Berlin), part of the 'parc aux ruines' that the artist has undertaken to build throughout the world: here, he had dozens of tons of crushed rubble from a demolished tower block of Issy-les-Moulineaux dumped on the main alley of the Renaissance castle of Oiron (West of France). At the same time discrete and spectacular, the artist's intervention takes visitors to step on the ruins of modernist utopies to access a piece of heritage. 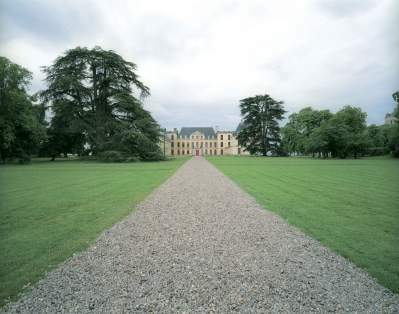 La grande allée du château de Oiron is also the title of the photography that documents this intervention, taking after Düsseldorf school of photograph's codes while pushing them to their ultimate stage: monumentality, frontality, absence of narration – it is impossible to identify the season of the year or the time of the day; but instead of picturing an arrogant modernist building, only remains a pyramid of ruins.